We set the Standard in Luxury Accommodations. 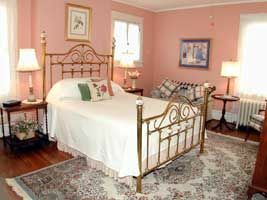 Abingdon Virginia's premier B&B lodging. 1920's era Colonial Revival home, centrally located in the Historic District. Featured in Southern Living. Seven spacious guestrooms individually decorated with antiques, including sitting areas, desks, telephones, radio/alarms, modern bathrooms, whirlpools, robes, hair dryers and each with room-controlled air-conditioning and heat. Relax in our spacious parlors or on the old-fashioned wrap-around porch with swing and rockers. A Gem waiting to be discovered. Enjoy a relaxing walk along tree-lined streets throughout the historic district. We are only two blocks from the world-famous Barter Theatre and Martha Washington Inn and three blocks from the head of the Virginia Creeper Trail, a 34-mile Rails-to-Trails footpath, birding and bicycle trail. A generous gourmet breakfast is served in the dining room and sunroom. Breakfast includes seasonal fresh fruit, juice and hot entrée. Fresh brewed coffee, tea, sodas, and juice are always available. Complimentary wine on arrival. Packages available for all occasions including Weekends, Barter Theatre, and Creeper Trail. Treat yourself to a memorable B&B experience. 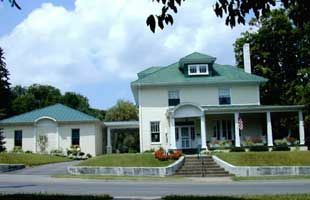 This and other Abingdon Bed and Breakfast Inns can be found here in The Register.